FSU Art faculty, Keith Roberson’s interactive work is prominently showcased at the Telfair’s Jepson Center 9th annual Pulse Art + Technology Festival from January 21 -January 25th in Savannah, Georgia. Professor Roberson’s immersive fictional-documentary interactive work is intended to recreate the mysterious experience of night-time forest exploration in the Apalachicola Forest. 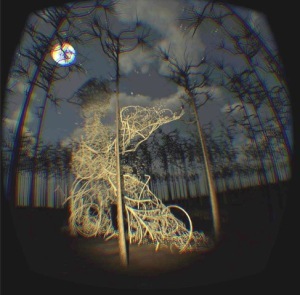 Donning a set of Oculus Rift Goggles, and a virtual flashlight, an audience member walks through the windy, night-time forest. Other audience-members can interact within the scene by puppeteering a creature who follows the action. This creepy, exhilarating VR artwork was created to mimic the experiences of the artist and his friends who explore this mysterious North Florida forest and will be displayed in the atrium of the Jepson museum building. PULSE Art + Technology Festival bringing multi-sensory fun and innovative technology-based art to Savannah. More information about PULSE events and workshops can be found at http://www.telfair.org/museum-events/pulse.